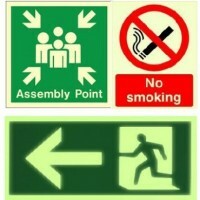 Make your safety signage clearer, stronger and brighter and you make your environment safer. Make it quick-drying and easier to print and you make production faster and more flexible. Discover the photoluminescent film that does both. Why Jessup Glo-Brite® 7535 photoluminescent film? Easy printing: Solvent. Eco-solvent. UV. Whatever inks you choose, and however you print them, Glo-Brite® 7535’s exceptional ink adhesion means edges are crisper and colours sharper. Excellent layflat characteristics make working with Glo-Brite® 7535 easy. Glo-Brite® 7535 photoluminescent tape exceeds the performance requirements of PSPA Class B. NOTE: For full technical information please ask for a data sheet. For specific performance data please contact us. Glo-Brite® 7535 is available in self-adhesive rolls and sheets, rigid sheets and printed tapes.